The terrorist attacks in New York City and Washington DC on September 11th touched people worldwide, and cartoonists have turned to art to express their grief. 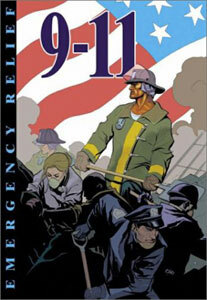 9-11: Emergency Relief is a comic book project to benefit the American Red Cross featuring some of the comic world's leading talents. From legendary creators such as Will Eisner to hot new talents such as cover artist Frank Cho, cartoonists from all areas of the cartooning world have joined together in this community effort. The most compelling early books on September 11, 2001, are pictorial works (see "The Day the World Changed" [BKL F 1 02]) depicting the World Trade Center attack as history-in-the-making. This collection of "comics" reports how its contributors, many of them New Yorkers, reacted physically and emotionally. In Cleveland, all autobiographical comics writer Harvey Pekar could think was, "I bet it don't get any easier from here on." Evan Forsch was at work in Suite 8901, One World Trade Center that day; "Down and Out" shows how he got out. Brooklyner Jenny Gonzalez, who has had psychiatric problems, wound up wishing she had flipped out again and "that none of this were true." Michael Kupperman, creator of the terminally droll Snake 'n' Bacon's Cartoon Cabaret (2000), re-envisions Goya's Sleep of Reason. Others tell of reacting from afar, and some candidly disclose their poor reactions. The range of drawing styles runs from polished mainstream comic-book-like to rough "underground" individualist to painterly. The publisher says all its profits from this book will go to the American Red Cross. Publisher and editor Mason has put together an impressive black-and-white anthology recording the responses of many members of the comics community to the crisis in New York City on September 11, 2001. Contributors include comics legends such as Will Eisner, whose one-page statement is heartbreaking, while others are relative newcomers such as Jessica Abel. Some stories record the actions/reactions of the cartoonists on that fateful day, while others are impressionistic. What shines through this collaborative effort is individual reaction to a collective sense of terror. Of particular interest is the piece "Down & Out," which takes place on the lower level of the World Trade Center. The comics industry has had a strong response to the events of September 11, with DC Comics and Marvel Entertainment also producing tribute books, perhaps because heroism is one of the focal points of American comics. 9-11 tellingly depicts an uncertain and hesitantly optimistic worldview. Highly recommended for public and academic libraries. Adult/High School-More than 60 sequential art pieces address the responses of their creators to the events of September 11, 2001, in a collection conceived as a fund-raiser for the American Red Cross. Harvey Pekar, Jeff Smith, Jessica Abel, Ted Rall, Peter Kuper, and Will Eisner are among the dozens of creative artists who share their feelings, thoughts, and activities in the wake of the destruction of the World Trade Center and the other airline attacks on that day. While some, including Sam Hester, Josh Neufield, and James Kochalka, provide simple and explicit reports of having an ordinary day in the life of a working artist turn into an extraordinary confrontation with politics, bloodshed, and emotional upheaval, others offer complex tales and scenarios fraught with psychological peril or personal responsibility. Brian Clopper spent the day teaching elementary school students whom he had been told not to inform of national and world events, while Jenny Gonzalez, newly released from a psychiatric hospital, had to contend with her own breakdown and dental surgery. Most of the pieces here provide reportorial accounts, but a few offer brilliant metaphor instead. With so many viewpoints, the surprise is that the collection as a whole is even in quality and absorbing from beginning to end or as an anthology to be consumed in any order. This is important for school and public library collections, as well as for book discussions and auxiliary reading in social science curricula. A brilliant use of the medium. ...The black-and-white morality of comics makes the ideal canvas. It is fair to say that this tragedy--and probably more important, the ensuing conflict--will change the culture. They tell real stories and they tell important stories. The comics community is rallying together to tell their stories and help the victims of the tragedy. Jeff Mason is the Publisher of Alternative Comics, a company billed as `publishers of cool comic books.` Alternative Comics releases some of the most original and intelligent titles being created today including work from Graham Annable, Nick Bertozzi, Ed Brubaker, Tom Hart, Dean Haspiel, Sam Henderson, James Kochalka, Dave Lasky, Jon Lewis, Josh Neufeld, Jen Sorensen, and Steve Weissman. Alternative Comics` flagship title INDY MAGAZINE started its critically acclaimed publication in 1993, went exclusively to the web (indyworld.com) starting in 1999 and has been THE independent comic guide ever since. Indy Magazine covers independent, alternative, and self-published comic books, featuring news, interviews, reviews, convention reports, and articles about the incredibly diverse world of independent comics. When Jeff is not working on Alternative Comics` latest release, he is working diligently to protect everyone's rights as a criminal defense lawyer in Florida. Josh Neufeld has been drawing comics since he was four years old. With his friend of almost 20 years, Dean Haspiel, Josh co-created Keyhole, where Josh does stories about his travel experiences in Southeast Asia and Central Europe. Keyhole has run for six issues with two different publishers. Josh has contributed artwork to Harvey Pekar's American Splendor (Dark Horse), the SPX anthologies, The Big Book of Urban Legends (DC/Paradox Press), and Duplex Planet Illustrated (Fantagraphics), among others. He resides in Brooklyn and makes a living mixing freelance illustration with web design. All comics, characters, and related indicia are copyright © their respective creators, unless otherwise indicated. The COMIC-BOOK SUPERSTORE, all logos and related material are copyright © Carlton J Donaghe. All Rights Reserved.